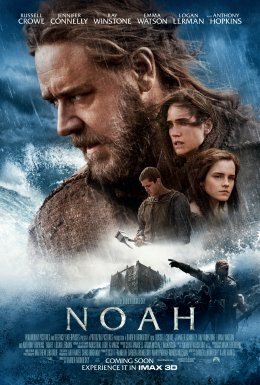 I recently watched the movie Noah starring Russell Crowe and even though I have posted a review on IMDB, sometimes a blog post allows me not just a lot more space to write about things, but also gives me the freedom to go as off topic as I like, which in this case is the topic of creation science, evolution, and the antediluvian world. It seems like the biblical story is one of those stories that seems to spur the imagination, and in a way this epic by Aronofsky is not the only journey that Hollywood has taken down this path. There has been a television movie and a mini series (to reference a few) as well as a really bad sequel to Bruce Almighty (called Evan Almighty - a movie that turns my gut even thinking about). However, I must be honest and say that I found this latest offering much better than I originally expected. Anyway, for those who don't know, the story of Noah comes from Genesis, the first book of Bible (Genesis 6:9-9:17) and tells the story of how the Earth had become corrupt and vile and God decided that he would wipe it clean, but before doing so realised that Noah and his family were still faithful and good people, so had him build an ark and then take two of every unclean animal and seven pairs of every clean animal (one of the many aspects of the story that seem to be ignored) before flooding the entire world. As for the movie, as I suggested it was much better than I originally expected it to be, and while there may be some poetic license taken in its creation, I still thought that there were a couple of ideas that really stood out and that I wish to explore. If you noticed the Bible verse that I quoted at the beginning of this post you will notice some interesting things that are mentioned. First of all this particular verse occurs prior to the flood and suggests the development of two ideas: art (the lyre and the pipe) and technology (forger of bronze and iron). I have long since speculated that the antediluvian (which means 'before the flood' civilisation could have been much more advanced than we have originally given it credit (that is if we believe, as I do, in a world wide catastrophic flood). While some of the sources that I will refer to, such as the discovery of a bell within a lump of coal, refer to websites run by creation scientists, I generally do not agree with everything they write, I still think that some of these ideas need to be considered. 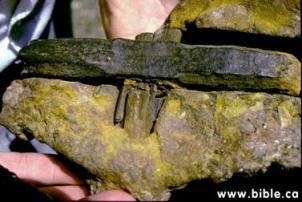 For instance, we have this iron tool discovered encased in rock. So, what about the film? Well, the opening of Noah showed a world in which humanity had become quite technologically advanced and that they were more than just simply nomads, but rather a society, albeit a very dictatorial one, who had advanced significantly beyond the stone and iron age cultures in the post flood world. While many of us in the secular world scoff at the writings of creation scientists, particularly the young-earth creation scientists (of which I am not), they have taken a more environmentalist approach in recent years. For instance we have organisations such as the Evangelical Environmental Network who campaign against deforestation, climate change, and the mercury poisoning in our water supplies. As such it is not surprising to see this film also taking an environmental slant as well. The thing with the antediluvian world in Aronofsky's film is that the use and development of technology has had a devastating effect upon the environment resulting in mass extinctions and desertification. While me may consider the world of the 21st century being ravaged by the effects of climate change with encroaching deserts and water sources drying up, this world, a world that had literally arrived at the brink of destruction, is a picture that is being painted of our future if we do not pull back from the direction that we are heading. If God is God, then God is powerful enough to create the world with the click of his fingers, if he really wanted to. Since God is a merciful God he set about a way in which to gradually restore this broken relationship and that is through him becoming human in the form of Jesus Christ, willingly dying on the cross as punishment for us, and then rising from the dead to demonstrate that he was who he said he was. The argument of a young Earth, in my opinion, gets in the way of this central message. However, that does not mean that everything that the young earth creationists should be immediately discounted, but rather to be read and weighed up based upon what we accept for ourselves. Do I believe in evolution? Yes. Do I believe that we all evolved from a single celled organism? No. Do I believe that God used evolution to bring about the world as it is today? Yes. Do I believe that there are problems with evolution? Absolutely. While I will say a few things about evolution, I will refer you to reviews that I wrote on a couple of plays by George Bernard Shaw: Man and Superman and Back to Methusela. The reason that I refer to those two plays, and the reviews thereof, is because I believe that Shaw outlines some of the problems that we face with evolution. For instance the idea of 'survival of the fittest' and 'red in tooth and claw' actually undermine the concepts of evolution as being a viable theory for the development of humanity. The idea here is that only the strongest survive, which means the warrior will inevitably outclass the intellectual resulting in a world ruled by vicious brutes. Unfortunately though, this is the world in which we live, with the exception of one thing: Bill Gates earns substantially more money than the most highly paid sports stars. In fact, I cannot think of one person who has become a billionaire through either acting or sport - it simply does not happen. Ignoring the wealthy who come about through inheritances (such as James Packer), many of have gained their wealth through simply being smart (or great businessmen). For instance, we all know how Bill Gates and Steve Jobs earned their fortune by getting in on the ground level of the computer revolution, or how Warren Buffett became wealthy through intelligent investing. However, while it is clear that the intelligence of these few 'geeks' enabled them to earn their billions, it is not the only factor - if that were the case there would be many, many more billionaires out there - they became wealthy through shrewd business practices and making sure that their businesses crushed any competition. However, if we look at the natural world we will notice that it is not the predators that are the dominant species, which would be the case if the idea of 'survival of the fittest' were true. Animals have their own natural defences to be able to resist the attacks of these predators, such as the Rhino's horns, the Giraffe's legs, and the fact that the elephant is just so damn big. However, survival of the fittest does not necessarily exist in an interspecies environment, but rather within the species. The weak and the old will tend to be those caught and killed first, leaving the healthy and the young able to escape and continue to breed. However, even animals realise the necessity to protect some of the weakest, especially babies, because if it were the case that only the strong were to survive, then all of the babies would end up being killed off resulting in extinction - but that does not happen. While I could write a lot more on evolution, I think I will leave it at that and move onto the next topic (maybe leaving it for another time), that being The world wide flood. What's the deal with the flood? I guess there are two reasons as to why people don't like the idea of the world wide flood: that it paints a picture of God that makes us feel really uncomfortable - namely that he does punish sin; and that in our scientific mind we find the idea of the world being covered by water very difficult to believe. I personally believe that it is possible, and wonder what would happen if all of the water locked up in the ice caps were to suddenly melt. Okay, with the potential impact of climate change, there has been substantial research into how far the seas will rise. However, as with most aspects of science, we can only predict what might happen based on past results - the future is always going to be a cloud that is very difficult to pierce. However, the idea of the Biblical flood is something that many academics seem to scoff at, believing that it is basically a myth that was brought to Israel from their Mesopotamian origins. Granted, the Epic of Gilgamesh and the Atrahasis also contain the story of the flood, but the argument is that since the Tigris and Euphrates were prone to flooding, from the view point of an Ancient Mesopotamian standing on the walls of the city it would appear that the entire world was subject to inundation. However, this was a regular occurrence, which is hardly going to result in the development of a myth - such myths would more likely arise from a single catastrophic event as opposed to something that occurred annually. Yet the similarities between the story in the Bible and the story from Mesopotamia are striking, which does ideally suggest a common source. Mind you, considering that Abraham, before he was commanded by God to leave his home and travel to the Levant, lived in Mesopotamia, these similarties are not all that surprising. However, some recent theories have suggested that this myth may have arisen not so much from the regular flooding of the fertile crescent, but rather the flooding of the region that is now the Black Sea. This would offer explanations as to why the Greeks, the Mesopotamians, and the Jews all have similar stories. However, that does not account for the multiple other flood stories that seem to be found all around the world (see wikipedia for a list). While it has been a while since I took a huge interest in the debate regarding the flood, some of the creation science websites, such as Answers in Genesis and the Institute of Creation Research do offer some interesting perspectives. However, I might add that while these two organisations tend to be very dogmatic in their views, I do not believe that one's opinion on the extent of the flood really matters, in much the same way that one's opinion on creation of the universe matters. Once again, I could probably say a lot more on this topic, but once again I will leave it at that and finish off on my final topic, and that is fire. I only want to touch on this topic briefly because I will be saying a lot more of it in another post looking specifically about the myths relating to fire. What I want to suggest is that fire is one of the essential elements for technology, which raises the question that if the creation scientists are correct, and that coal seams and oil deposits are the result of Noah's flood, then that leads to this question: what fuel did the antediluvian's use? Well, Aronofsky answers that question by creating a special mineral that bursts into flames when struck, and while I thought that was interesting, I would put it into the category of fantasy. However, people have been able to work with metal long before coal came into common use, and were able to generate high temperatures, usually from wood (and okay, they did have oil lamps). However, it is also worth noting the modern use of biodiesal, however I am inclined to suspect that biodiesal only came about after we learnt how to refine petrol from oil. Yet with coal, wikipedia indicates that it was used by the Chinese as early as 1000 BC yet the Europeans only became aware of it after Marco-polo returned from his trip to the orient. However, it wasn't until the 17th Century that coal replaced charcoal as a fuel for the forges. This suggests that coal was not actually a necessity for the smelting of metals. However, as I have suggested, I will leave further discussion of technology for another post (Prometheus and the Quest for Fire). Noah and the Antediluvian world by David Sarkies is licensed under a Creative Commons Attribution-NonCommercial-NoDerivatives 4.0 International License. Hammer in Stone: Source 6000years.org used under the fair use provisions to provide an illustration to the topic being discussed.